Helix Backpack is a rugged, go anywhere custom-designed carrying case made especially for Helix floor processor. The same care and attention to detail that went into Helix’s design is reflected in the backpack. From its luggage-grade construction and closed cell foam padding to its rugged, molded rubber carrying handles and water-resistant zippers, Helix Backpack will protect your gear for years to come. 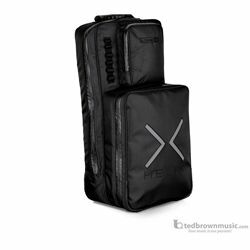 For the ultimate in convenience, Helix Backpack provides ample room for additional items such as sheet music, cables, small pedals, power supplies, and other accessories.